It has been quite a while since I last posted. Sorry about this long absence. Too many things have been going on at once. Lots of time every day spent painting to complete designs by deadlines both self imposed and by clients. The other reason is that I have been devoting a lot of time to Maggie, our 15 year old cat, who has had serious health problems. She now has a malignant growth and it means that her long wonderful life will most probably come to an end this month sometime. I am spending a lot of time just petting and talking to her and offering her treats and playing with her. She still has a sense of curiousity and play which is wonderful.. I want to make the most of this time with her. This is my apology for being so long absent. 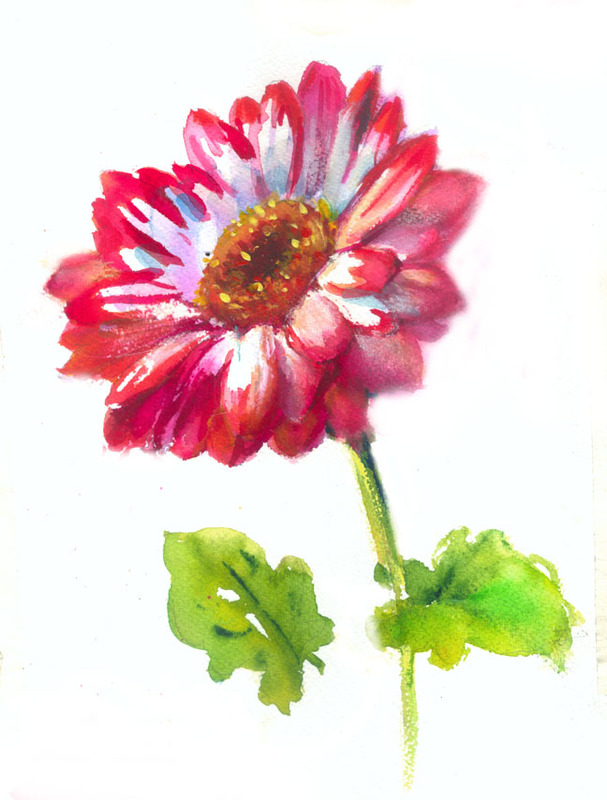 I had painted spring flowers , tulips, poppies, gerbera daisies and daffodils to be used in a series of “spring bloom” designs. I now take photos as I paint so that I can see how the colors and values are going to show up on the computer and so I have a record both to share and to help me remember the process of painting. 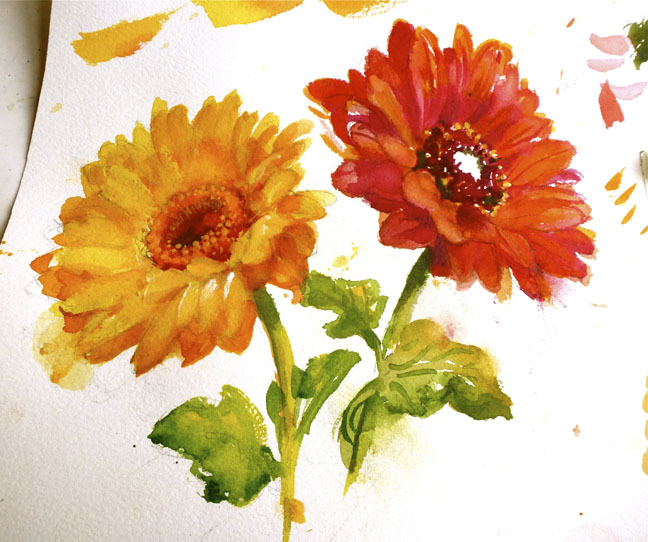 Here is an almost finished painting of two Gerbera daisies. I ended up overdoing the end of the painting process, making the actual finished painting unusable. But because I had taken a photo at an earlier stage I can use the flowers for a design. I just need to finish the center of the red daisy and brighten up the yellow, which can be done in photoshop.. I’m not happy with the leaves and will probably redo them. Same goes for the leaves on the Red and White daisy. I would like them to be a bit more realistic to go with the style of the flower. One of the things I am really focusing on is learning the difference between the more opaque and the transparent pigments and how and when to use them. I am finding that this makes a big difference. I find it better if I work with the transparent colors first and then add the final details in an opaque. Transparent colors let light pass through and have a lovely glow when you layer them. 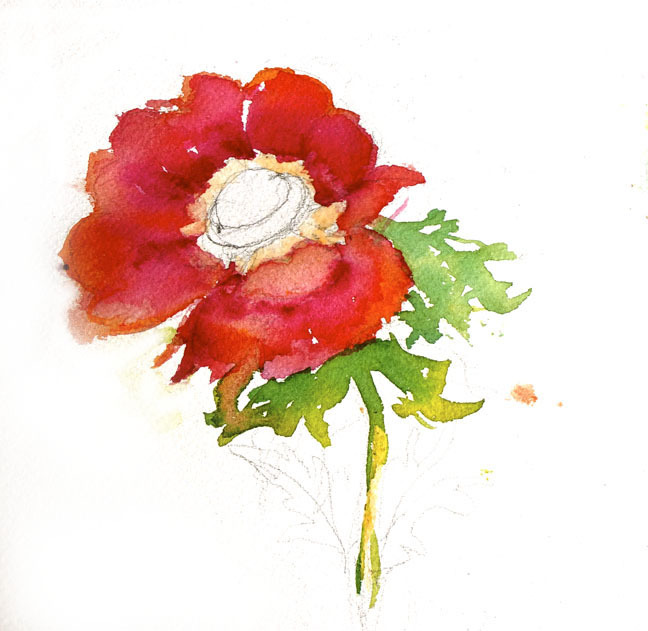 Next I worked on a red poppy. You will notice that I am using a watercolor style for these spring flowers that is not as loose as some other paintings. I wanted these flowers to be lush in color and fairly detailed in form. I start out loose and watery and then let the paint dry, rewet areas and continue to paint. This is just another way to approach watercolor. It is an extremely versatile medium and that is why it is always interesting and engaging. Here’s a close up to better see the watercolor. It is a bit blurry but I think it shows the loose style at this stage. 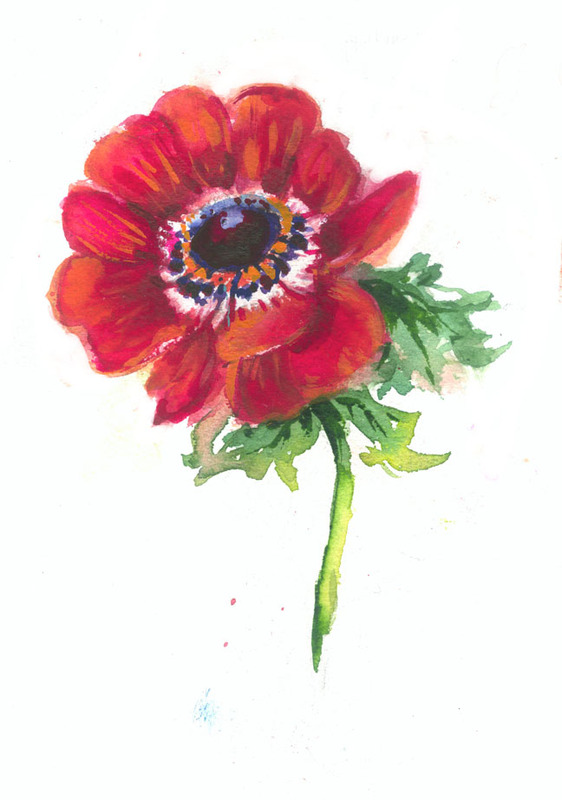 Now here is the finished poppy watercolor. Notice the details I added as well as the darks in an opaque crimson red. Again same goes for the leaves. d I went on to finish the poppy. One last spring flower and the one that I worked on the longest and hardest, is the daffodil. I will show you that in the next post and how I got to the one I was happiest with and painted very large. I’ll also show you my chart of yellow swatches which I found very helpful in really knowing the personality of each yellow. It is a sun filled and cooler morning today. Maggie and I had a long cuddle and she ate well. Thanks for being patient and hanging in there with me. Let me know if you are finding these watercolor lessons interesting. Your comments are always welcome. Andy, I was fascinated by the way you develop the paintings. Those daisies are luscious — good enuf to eat, the poppy, too. Ty for the pic of Maggie, such lovely pose. Adjusting to maine – babies are exhausting!!!!!! I was wondering what happened with you, Andrea. Sorry to hear about Maggie. 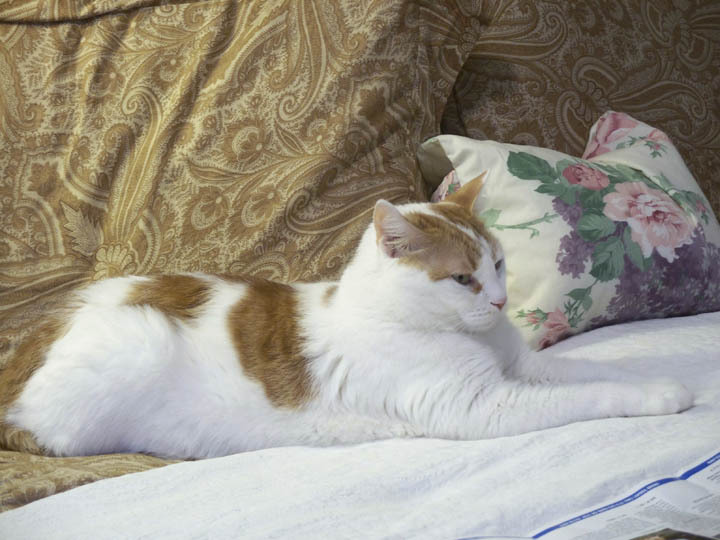 Seeing the decline of a dearly beloved pet is very hard. Your venture with these recent florals resonates with me. I love loose as well as detail, and getting the right balance is a challenge. These are beautiful in both early and late stages. Thanks to PS you can switch out what’s not working for you. Really beautiful. I’m just enjoying the beauty…. and not attempting to paint along. HI Andrea – Beautiful. I sent Dennis a note… I’m looking for Christmas. Any ideas. Holiday consists of Autumn, Thanksgiving, Christmas and Hanukkah. Talk to Dennis… more details in his email. Hi Tom. Haven’t seen your e mail yet to dennis.We are working under a tight deadline and he is glued to his computer and no longer hears my voice. I will certainly look at it. We have some wonderful new Christmas, two collections(7 designs in all) which we can send you tomorrow. Also several new jewish holiday designs and autumn and a watercolor turkey. I’ll be working on autumn next . How long will you be looking. Thanks for following my blog. So nice to hear from you. The process is fascinating. Watercolor has always been a mystery to me. I think of it as, literally, watery and gauzy, but I’ve long known of those wonderful 18th century folios of plants and animals, where the colors are as deep and dense and precisely laid on as in an oil painting. Now I’m getting some idea of the techniques that can produce different effects. Thank you for opening my eyes to this. Enter your email address below, then click on the "Sign me up!" button to subscribe to this blog and receive new posts via email.